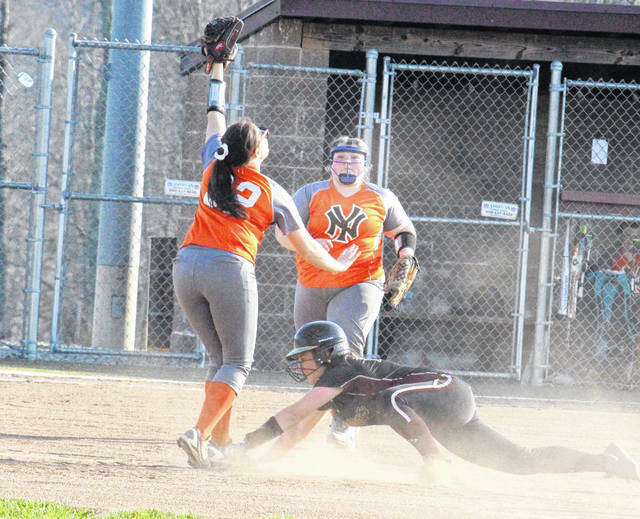 Meigs freshman Jerrica Smith slides back into second base, during the Lady Marauders’ 15-5 victory over Nelsonville-York on Friday in Rocksprings, Ohio. ROCKSPRINGS, Ohio — Once the Lady Marauders started rolling, there was no slowing them down. 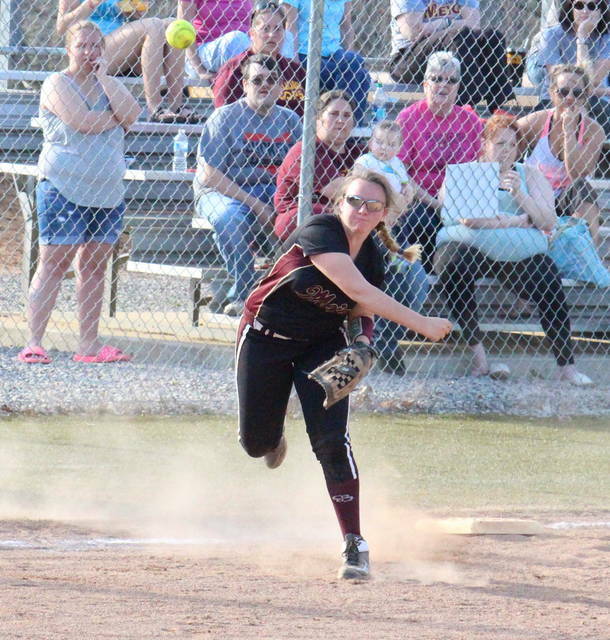 The Meigs softball team was held scoreless in the first inning of Friday’s Tri-Valley Conference Ohio Division game in Meigs County, but the Lady Marauders snapped out of their cold spell and claimed a 15-5 victory in five innings over Nelsonville-York. Meigs (6-2, 4-0 TVC Ohio) broke the scoreless tie in the bottom of the second inning when Jerrica Smith drove in Chonslyn Spaun. With one out in the frame, Alyssa Smith scored on an error, and then Hannah Tackett scored on another error, giving MHS a 3-0 edge. The Maroon and Gold stretched their lead to 9-0 in the bottom of the third, combining five hits and a pair of walks. The Lady Buckeyes ended the shut out after an error in the top of the fourth, but Meigs tallied two runs in the bottom of the frame as Alyssa Smith doubled home Jerrica Smith, and then scored on a Bre Lilly single. NYHS exploded for four runs on three hits, two errors and a hit batter in the top of the fifth inning, trimming the MHS lead to 11-5. In the home half of the fifth, Meigs pushed across the four runs it needed for the 15-5 mercy rule victory. 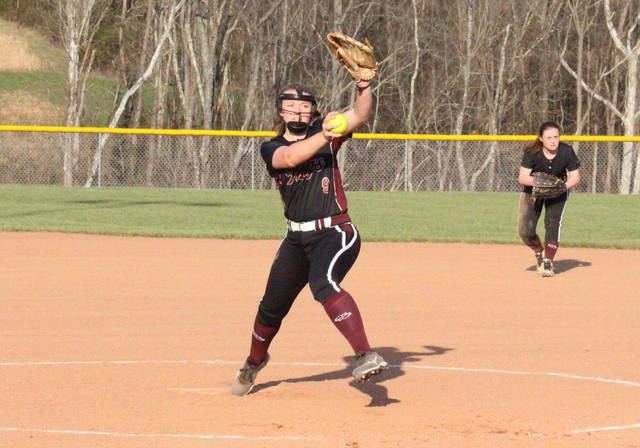 Breanna Zirkle struck out three batters in a complete game and earned the win for Meigs, allowing five unearned runs on nine hits and two walks. Skylar Riffle suffered the loss in three innings of work for Nelsonville-York, allowing 13 earned runs on 16 hits and three walks. Leading the Lady Marauders, Alyssa Smith was 3-for-3 with a triple, a double, four runs scored and two runs batted in. Lilly was 3-for-4 with a double, a run and two RBIs, Zirkle was 3-for-4 with a trio of singles, while Jerrica Smith was 2-for-4 with two runs and one RBI. Taylor Swartz doubled once and drove in two runs for MHS, Peyton Rowe added a double, while Tackett singled once, scored three times and drove in one run. Karington Brinker singled once and drove in two runs, Ciera Older added a single, while Bailey Tracey scored once in the win. Riffle led the Lady Buckeye offense with a 3-for-4 day, which included an RBI. Both teams had four errors in the contest. 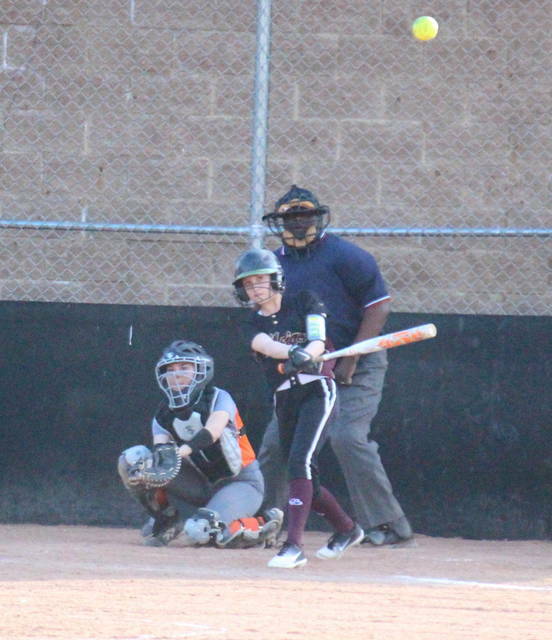 Meigs stranded six runners on base, while the Lady Buckeyes left nine. NYHS and MHS will do battle again on April 27. The Lady Marauders return to action on Monday at Athens.